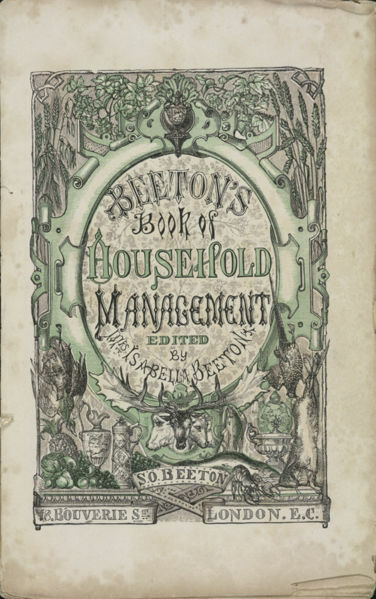 Mrs Beeton’s Book Of Household Management is a forgotten classic of domestic literature. This guide covers every aspect of running a Victorian household, such as the duties of both a mistress and a housekeeper, cookery, animal husbandry, fashion, childcare and a lot more. 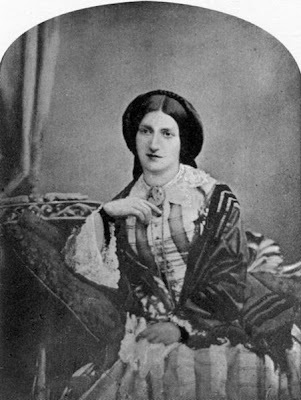 It was compiled and edited by Isabella Beeton, the wife of Samuel Orchart Beeton, a publisher of books and popular magazines. Isabella often helped Samuel with his work, writing articles on household management and cooking for his publications such as a monthly supplement for The English Woman’s Domestic Magazine, the first magazine devoted entirely to women and their interests. In 1861, these supplements were published in a single book, The Book Of Household Management. Four years later, Isabella died from puerperal fever. I thought it’d be interesting to share some of Isabella’s recipes and advice, which give us an insight into what managing a household in Victorian times was like. The book begins by comparing the mistress of a house with a commander of an army: “As with the commander of an army, or the leader of any enterprise, so is it with the mistress of a house. Her spirit will be seen through the whole establishment; and just in proportion as she performs her duties intelligently and thoroughly, so will her domestics follow in her path.” She then went on to say that the mistress of a house should rise early, be clean, practise frugality and economy at home, be hospitable and polite, but choosy in forming friendships, and do charitable deeds. Ingredients: The remains of cold roast or boiled chicken, 2 lettuces, a little endive, 1 cucumber, a few slices of boiled beetroot, salad-dressing No. 506. Mode: Trim neatly the remains of the chicken; wash, dry, and slice the lettuces, and place in the middle of a dish; put the pieces of fowl on the top, and pour the salad-dressing over them. Garnish the edge of the salad with hard-boiled eggs cut in rings, sliced cucumber, and boiled beetroot cut in slices. Instead of cutting the eggs in rings, the yolks may be rubbed through a hair sieve, and the whites chopped very finely, and arranged on the salad in small bunches, yellow and white alternately. This should not be made long before it is wanted for table. Average cost, exclusive of the cold chicken, 8d. Ingredients: 1/2 lb. of flour, 1/2 lb. of treacle, 1/2 lb. of suet, the rind and juice of 1 lemon, a few strips of candied lemon-peel, 3 tablespoonfuls of cream, 2 eggs. Mode: Chop the suet finely; mix with it the flour, treacle, lemon-peel minced, and candied lemon-peel; add the cream, lemon-juice, and 2 well-beaten eggs; beat the pudding well, put it into a buttered basin, tie it down with a cloth, and boil from 3–1/2 to 4 hours. Time: 3–1/2 to 4 hours. Seasonable at any time, but more suitable for a winter pudding. Treacle, or molasses: Treacle is the uncrystallizable part of the saccharine juice drained from the Muscovado sugar, and is either naturally so or rendered uncrystallizable through some defect in the process of boiling. As it contains a large quantity of sweet or saccharine principle and is cheap, it is of great use as an article of domestic economy. Children are especially fond of it; and it is accounted wholesome. It is also useful for making beer, rum, and the very dark syrups. Ingredients: To every 2 lbs. of flour allow 6 oz. of moist sugar, 1/2 gill of yeast, 1/2 pint of milk, 1/2 lb. of butter, warm milk. Mode: Put the flour into a basin, mix the sugar well with it, make a hole in the centre, and stir in the yeast and milk (which should be lukewarm), with enough of the flour to make it the thickness of cream. Cover the basin over with a cloth, and let the sponge rise in a warm place, which will be accomplished in about 1–1/2 hour. Melt the butter, but do not allow it to oil; stir it into the other ingredients, with enough warm milk to make the whole into a soft dough; then mould it into buns about the size of an egg; lay them in rows quite 3 inches apart; set them again in a warm place, until they have risen to double their size; then put them into a good brisk oven, and just before they are done, wash them over with a little milk. From 15 to 20 minutes will be required to bake them nicely. These buns may be varied by adding a few currants, candied peel, or caraway seeds to the other ingredients; and the above mixture answers for hot cross buns, by putting in a little ground allspice; and by pressing a tin mould in the form of a cross in the centre of the bun. Sufficient to make 18 buns. Ingredients: To 4–1/2 gallons of water allow the pulp of 50 lemons, the rind of 25, 16 lbs. of loaf sugar,—1/2 oz. of isinglass, 1 bottle of brandy. Mode: Peel and slice the lemons, but use only the rind of 25 of them, and put them into the cold water. Let it stand 8 or 9 days, squeezing the lemons well every day; then strain the water off and put it into a cask with the sugar. Let it work some time, and when it has ceased working, put in the isinglass. Stop the cask down; in about six months put in the brandy and bottle the wine off. Seasonable: The best time to make this is in January or February, when lemons are best and cheapest. Mrs Beeton’s Book of Household Management also features information on what the duties of each domestic was, how to take care of infants and cure children when they fell ill and lots more. If you’re interested in the book, you can read it online for free.